MASTER THE RIDING ENVIRONMENT: KLIM introduces the first optically superior shield system capable of the highest performance in all light conditions. Featuring proprietary adaptive lens technology from TRANSITIONS®, KLIM’s TK1200 reacts instantly to changing UV levels. Riders enjoy reduced eye fatigue, increased light and damaging ray protection and superior clarity thanks to minimal lens distortion. By eliminating archaic internal visors, KLIM can deliver a superior riding experience with full field-of-vision and adaptive lens technology. KLIM developed a proprietary break-away chin bar into the TK1200 that reduces force upon the head and neck in the event of an accident with the modular system in the open position. ENGINEERED AERO ACOUSTICS: Focus on the road ahead and fully engage with the ride thanks to KLIM’s perfected Aero Acoustic performance. Combining sleek and stable aerodynamics, intelligent ventilation design and a premium liner system, KLIM makes it easy to keep riding mile after mile. SUPERIOR FROM THE START: The KLIM TK1200 features a full carbon-fiber shell construction done differently. Pre-impregneted fiber weaves combine with our proprietary Polymerisation heat and molding process to ensure precise temperature and duration of resin cure times. This hyper attention-to-detail ensures a higher quality construction and unmatched hand-made consistency only found in KLIM’s premium helmets. 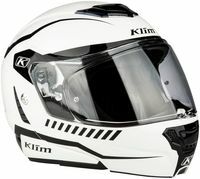 FIT RIGHT, FEEL RIGHT: Featuring an intermediate oval fit, KLIM’s sizing system allows riders to lock into a helmet that is snug and tight, but without pressure points. This attention to detail ensures comfort extends beyond the showroom feel and for years to come. Combined with KLIM’s ergonomic 3D Padding and washable, removable hypoallergenic liner, the TK1200 was built to fit like a dream in speed. KLIM’s micro-metric buckle securement allows for quick fitment and even faster release—getting your custom fit experience on and off with ease. Set it and forget it and experience the best fit on the street. IT’S GOOD TO BE SEEN: KLIM’s leading passive safety design experience and proficiency in hi-visibility and retroreflective materials is infused in theTK1200’s DNA. Rear-facing reflective accent materials on the helmet liner increase low-light visibility of the rider’s head. The real result: riders are seen sooner and more often by traffic’s headlights. Engineered to provide more effective ventilation than the old guard of helmet brands, KLIM built a fresh-air system worthy of the next generation. The adjustable intake port directs airflow to the crown of the head, filling the volume more efficiently and cooling more rapidly. Thanks to innovative construction techniques and premium materials, The KLIM TK1200* meets or exceeds the most demanding ECE and DOT standards* for street helmets at reduced weight compared to the competition. Premium Polycarbonate Anti-Scratch shield tech takes the lead with Pinlock ready systems standard to ensure a clear road ahead. Clear and Smoke options available to custom tune the ride to conditions. Below is a size chart provided by Klim for this product. If you have questions about how this helmet might fit as compared to other helmets in your closet, please visit this FAQ for some advice. Built-in pins on the shield along with the Pinlock® Anti-Fog Lens transforms your single shield into a dual shield that will resist fog buildup. Replacement cheek pads for the Klim TK1200 helmet. Fits the Klim TK1200 helmet.